Nick Burnett is our Physical Education and Health teacher. 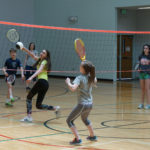 He earned his Bachelor’s degree in Exercise Sports Science from Oregon State University and his Master’s in Physical Education and Health from Concordia University in Portland. Mr. Burnett worked for six years as the physical education teacher at a charter school. He then worked for 2 years at a public school and an additional year as a substitute teacher. In his free time, Mr. Burnett enjoys walking his dog and taking him to the park. He likes to play catch and shoot hoops with his friends. You can catch him commuting via bike or at a local yoga class. He is also an avid sports fan and enjoys watching or listening to football games when he can. This is Mr. Burnett’s 1st year at Ashbrook Independent School.